City IndexWhat are the penalties for loitering around the world? Though many U.S. loitering laws have been found to be unconstitutionally vague, or struck down on First Amendment grounds, it’s still illegal to loiter in public in 35 percent of U.S. cities, according to a 2014 report from the National Law Center on Homelessness & Poverty. Loitering– which is defined by Newport, RI, for example, as "loafing or standing about aimlessly, and also including the colloquial expression 'hanging around'"– is a classic “quality of life” offense as part of urban “broken windows” policing. Consistent with those tactics, “loitering” is often paired with “loitering plus” ordinances like “loitering with intent” to panhandle, solicit prostitution, or sell drugs. Though many of these laws have narrowed in scope, their effect of criminalizing poverty and homelessness remains the same. So too has their efficacy in policing unrest. Protesters in Ferguson, Missouri who weren’t arrested for “manner of walking along roadway,” were often booked for violating the city’s broad loitering ordinance, which can be applied to anyone who “obstructs or encumbers the passage of persons or vehicles upon, through or into any street” and ignores a police order to move. How much regional variance is there to the loitering ordinance? Find out below, with an international look at the legal grey area that is being a person in a place. 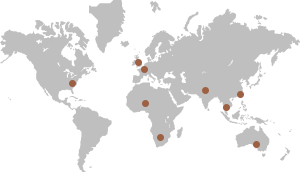 We chose 9 cities from across the globe, from New Delhi to Adelaide, to retrieve our data. 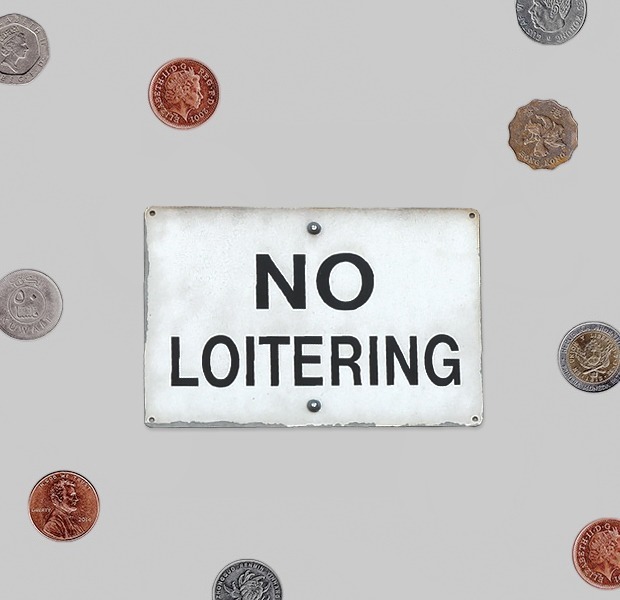 In New York, loitering is a class B misdemeanor that can be brought against people gambling in public, selling things, or busking on a subway platform without authorization. In October of last year, a busker arrested and charged with loitering was later described as a "transit recidivist" by an NYPD spokesperson, though Gothamist heard “no mention of him impeding transit activities.” The Times found that in the first two months of 2014—the same time elderly Korean patrons of a McDonald’s in Flushing were fighting for their right to sit there all day—arrests of peddlers and panhandlers on subways more than tripled those of the same period in 2013. Loitering in New York State can also apply to anyone who “remains in any place with one or more persons for the purpose of unlawfully using or possessing a controlled substance,” or does so for purposes of soliciting prostitution. Under the Delhi Police Act, “lying or loitering in any street, yard or other place, being a reputed thief and without being able to give a satisfactory account of himself” between sunset and sunrise can “be punished with imprisonment for a term which may extend to three months.” Technically, anyone dressed in frayed clothing is bookable for “loitering with intent” under the Vagrancy Act, which was identified by Indian legal experts in 2014 as one of the many ludicrous laws inherited from India’s period of colonial rule. In 2009, Taipei’s Ministry of Transportation and Communication passed a law levying fees between $1,500 and $7,500 NTD (between $50 and $250 USD) on homeless people who fail to comply with police warnings to leave public transit areas even while Taiwan’s stagnating economy has made the “sight of homeless people holding placards for elite properties at street corners... increasingly common” in the capital, according to a 2014 feature in the Taipei Times. A Social Welfare FAQ on the city government’s homepage instructs visitors to report “begging behaviors” to the police. Originally known as the Police Offenses Act when it was passed in 1953, the law was “mainly used by the police in controlling the activities of homosexuals prone to frequenting public places, ‘peeping-tom’ offenders, suspected milk can thieves and other nocturnal nuisances,” according to the 1964 Adelaide Law Review. One of Johannesburg’s bylaws makes it illegal to “lie, sit stand, congregate, loiter or walk, or otherwise act, on any public road in a manner that may obstruct traffic.” It has been used in mass arrests of Zimbabwean nationals, luggage porters, and the homeless. England, birthplace of the vagrancy law, is now a placewhere you are free to loiter within certain narrow conditions (though you should watch out for sidewalk spikes). The UK’s “suspected person law,” a stop-and-search “loitering with intent” program that was largely used to harass minorities, died in 1981. Still, you can be arrested in the UK for willfully obstructing free passage along a highway, begging, or “causing harassment, alarm, or distress,” which come with level 2 and level 3 fines of up to £1,000 ($1,500). Also, the stipulations of the recently expanded Crime and Disorder Act can get you labelled with an ASBO, or Anti-Social Behavior Order, which can augment these penalties to, say, five years in jail for begging. Nicolas Sarkozy’s 2003 Internal Security Law means that young people convicted of loitering in stairwells or the entries to apartment blocks can face up to two months in prison. It also punishes squatters and beggars operating in groups with six months in jail and a fine of €3,750 ($4,200). Sarkozy’s law came bundled with a number of “broken windows”-esque codes meant to cleanse public public space in France, including penalties for prostitutes found to be “passively soliciting” clients through their “dress or attitude.” As of 2006, policies like the Internal Security Law enjoyed “popular support,” according sociological researcher Phil Hubbard. This law was recently used to detain two Al Jazeera journalists covering the 2015 presidential election. They’d been reporting from the site of Nigerian military operations against Boko Haram.